The aim of this book is to make the Dialogues of the Gods by Lucian of Samosata (c. 120 – 190 CE) accessible to intermediate students of Ancient Greek. The running vocabulary and grammatical commentary are meant to provide everything necessary to read each page, so that readers can progress through the text, improving their knowledge of Greek while enjoying one of the most entertaining authors of antiquity. The dialogues present various gods and goddesses discussing some of the most famous episodes in mythology, showing the Greek gods to be petty and jealous beings rather than the august gods of Homer or tragedy. 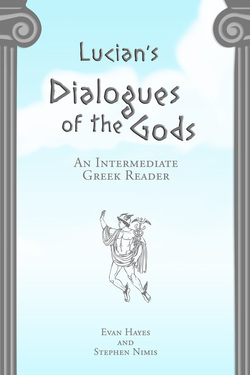 Lucian's Dialogues of the Gods is a great text for intermediate readers. The dialogues are breezy and fun to read with relatively simple sentence structure. Typical for Lucian, classical literature is the source for most of the material, with amusing takes on traditional stories. Lucian's Greek prose is patterned on the best Attic authors, a learned version of Greek that was typical of other writers in the imperial period of Greek literature.